When you cannot connect to your Windows Azure Virtual Machine with remote desktop, maybe you’re being blocked. Most companies don’t allow communication over all ports. This limitation can be overcome by changing the public port Windows Azure uses for Remote Desktop. Since your virtual machine is behind a loadbalancer, the communication to a specific machine uses port forwarding. Windows Azure ‘randomly’ assigns a unique port for your virtual machine. This unique port is forwarded to 3389 of your virtual machine. Now you can connect with the specific machine through the loadbalancer as it can be identified by the unique public port. 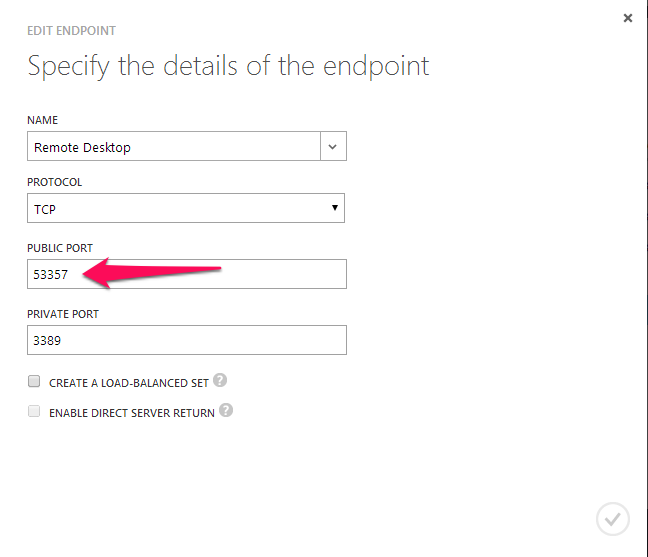 Changing to port mapping can be done in the Windows Azure portal. Now you can connect to the virtual machine by going to the dashboard tab, clicking connect and opening the downloaded rdp file. Your new assigned public port should be used, which is a port allowed by your company. This entry was posted in Security and tagged Remote Desktop Connection, virtual machine, Windows Azure. Bookmark the permalink.